Dr. Ingrid Parker is a Professor in the Department of Ecology and Evolutionary Biology and the Jean H. Langenheim Endowed Chair in Plant Ecology and Evolution at the University of California Santa Cruz. She is also a Research Fellow at the Smithsonian Tropical Research Institute in Panama. After working as an environmental educator, Ingrid completed her PhD in Botany from the University of Washington. She served as a Miller postdoctoral fellow at the University of California, Berkeley before joining the faculty at UC Santa Cruz. She has received many awards and honors during her career, including being named a Fellow of the California Academy of Sciences. Ingrid is with us today to tell us all about her journey through life and science. 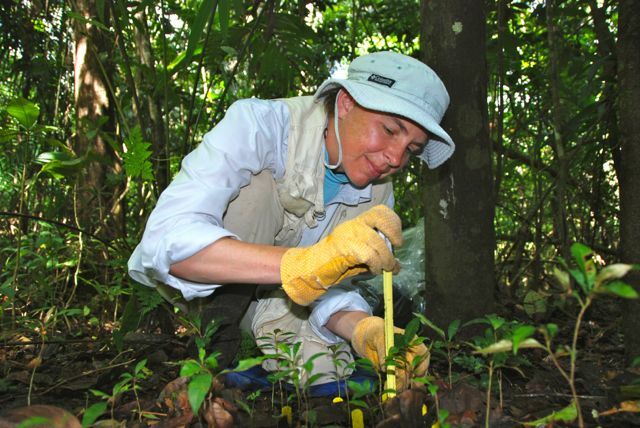 Ingrid studies invasive plants and the evolutionary ecology of species interactions, especially plant-pathogen and plant-pollinator interactions. The Parker lab studies a range of questions at the intersection of ecology and evolution, embracing both basic and applied systems. Much of Ingrid’s research is focused on understanding the causes, consequences, and dynamics of biological invasions, especial the effects of species interactions (e.g. herbivory, disease, pollination, and microbial mutualisms) on plant invasions. The lab works in both temperate and tropical ecosystems. As a result, Ingrid’s research time is divided among California, Washington, and Panama. When she’s not immersed in research, Ingrid enjoys spending time with her husband and 11-year old son.